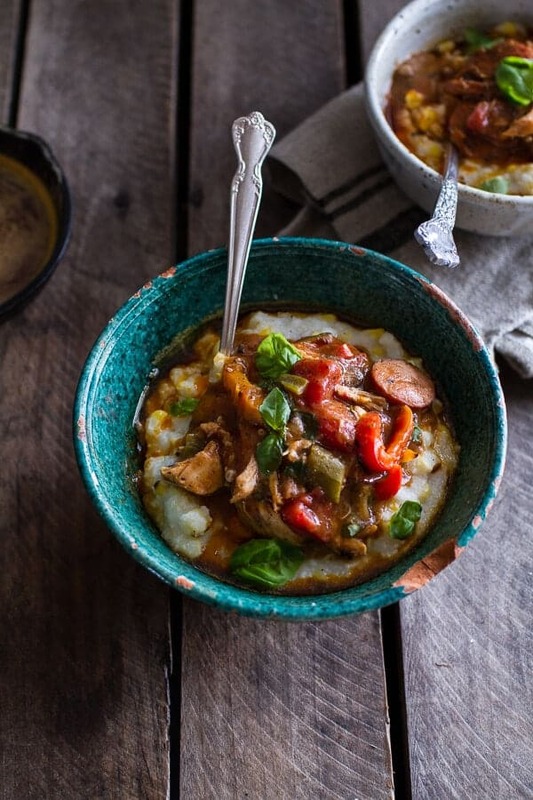 Quick Gumbo with Grilled Corn Grits + Smoky Chilied Brown Butter. So if there was ever a Monday meal you needed to make, this is it. Typically I think a lot of people feel like salads and lighter foods need to be Monday food, but I am just SO not one of those people. I love salad, but honestly today is not a lettuce in a bowl with some cheese kind of day. 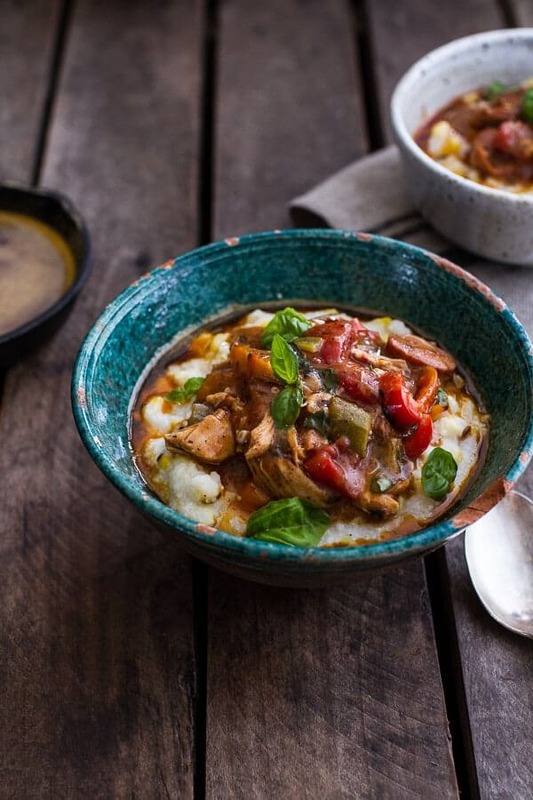 Nope, today is a grits with some butter and a quick, veggie packed, gumbo kind of day. It’s total health food and you know it. Hello, don’t you see all those pretty red peppers in there? And I mean fresh sweet corn mixed into the whole grainy (buttery) grits? See, healthiness in a bowl. And I am being serious here. On a different note, again in all seriousness, I think I have convinced my dad to turn his land into a smaller farm. Complete with horses, cows, goats and chickens. I can see it in his face, he SO wants to quit the day job and be a full on farmer. I am right there with him…. It’s ok if you think I am crazy, re-reading this myself I am thinking the same thing, but with our chickens now laying eggs, I have this huge desire to add onto our little family of farm animals. I am telling you, I was totally meant for this whole farm life thing. Of course, just don’t ask me to clean the poop. That’s a job for the people who do not handle everyone’s food. For now, I will have to be happy with our chickens. Which I totally am. I head down every morning before I hike to feed them and check for eggs. Their eggs are still pretty small right now, but their yolks are the prettiest shade of yellow. Honestly, I have not seen prettier yolks. They may be small, but they sure are cute. Over time the eggs should become larger and actually, only two of the chickens have started laying so hopefully we’ll be getting more than two eggs a day here pretty soon. Thus far, I have only fried them. I am leaving the yolks extra runny because if you ask me, there is nothing better than a perfectly runny yolk. Especially when the eggs are fresh from your back yard and not even an hour old. I love the fact that we raised those chicken from day two of their lives and have gotten to watch them grow. It’s a pretty cool thing. If I would have thought of it, I so would have put a fried egg on top of this gumbo. Next time I am totally doing that. Although, I am currently putting fried eggs on everything right now. 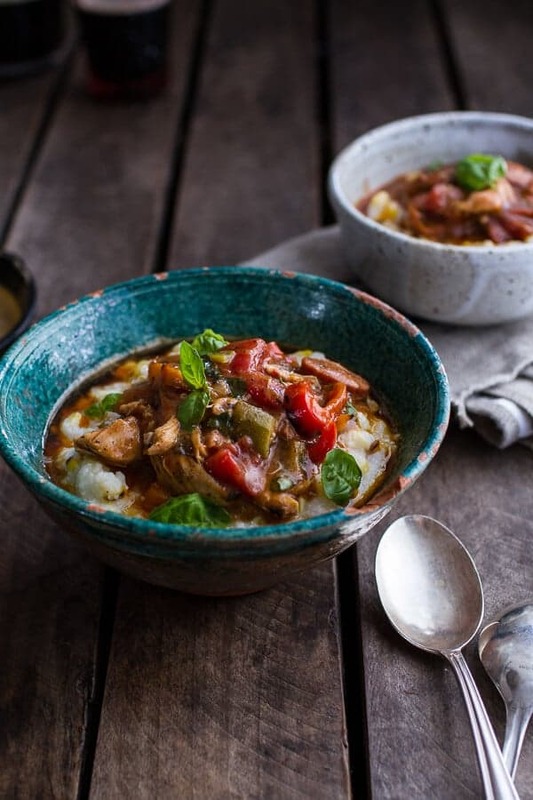 Egg or no egg though, this quick gumbo is DELICIOUS. It’s everything you crave and then some. 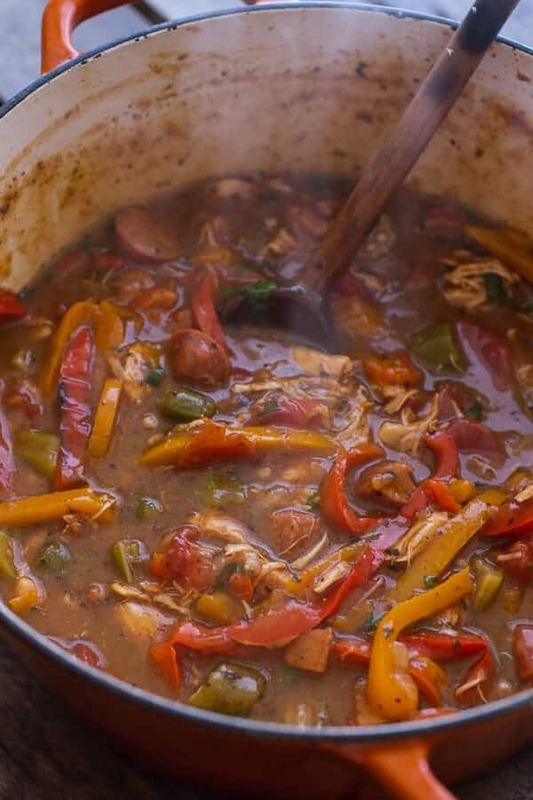 Now, I have a gumbo recipe that I love and it will, hands down, always be my very favorite gumbo recipe, BUT that recipe requires me to sit in front of the stove for at least thirty minutes and just whisk. Just whisk and whisk without taking an eye off the pot. It sounds worse than it actually is, but on most given days I just do not have the time to do this. So, I made a quick version. It’s still completely delicious, but in its own way. It’s unique, which I think is a good thing. 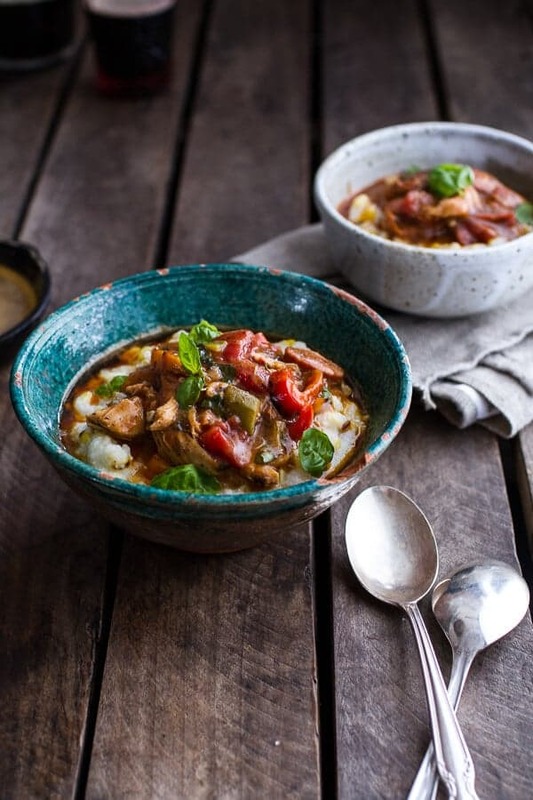 Since the gumbo was a little different, I figured it needed a different side, and since gumbo is oh so southern, grits immediately came to mind. Oh how I love grits you guys. I am totally an old soul, and grits are entirely my thing. Now I don’t really know the difference between grits and polenta, to me they honestly are one and the same (is it texture or types of corn used? Does anyone know? I would really love to find out). Today I made real grits though. I cook polenta all the time (and have some more coming your way soon), so grits was a nice switch-up. But um, they really do taste like polenta. And they also totally transform this dinner into something so special – as does the butter. Once you have the gumbo started, start in on the grits. 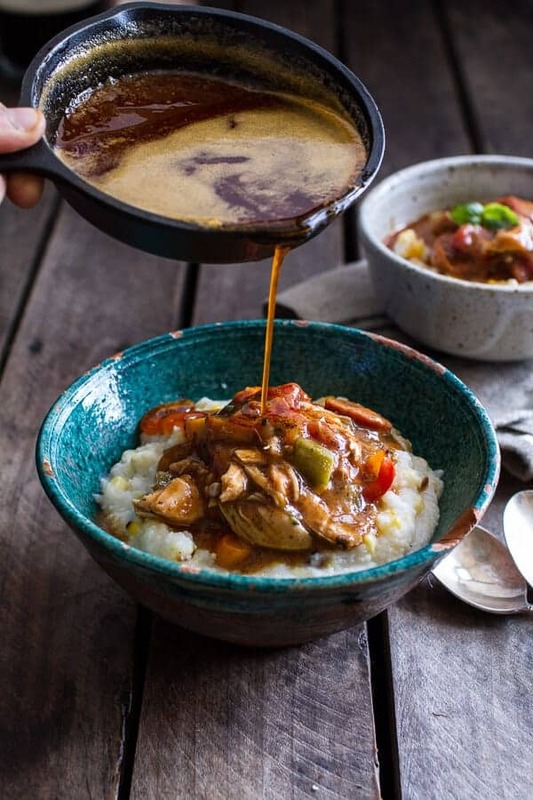 The whole meal only takes about forty minutes, but you have to be cooking the gumbo while making the grits. Ok, so now you’ve got those creamy grits, that you top um with the gumbo. That is a good meal, but… it could be better. How? Smoky chilied brown butter. Oh yes, I went there… and on a Monday too. You are either loving me or hating me right now, but I am hoping the majority is leaning towards the nicer side of things. It’s browned butter done savory and it’s the perfect final touch to this meal. In a large soup pot, heat the oil over medium heat. Whisk in the flour and cook, whisking, until the flour begins to brown, about 4 minutes. Reduce the heat to low. Stir in the garlic, onion, orka and bell peppers, cook until the veggies begin to soften, about 5 minutes. Add the tomatoes, thyme, oregano, basil, creole seasoning, chili powder, cayenne, salt and pepper. Cover pot and cook for 5 minutes. Stir in the broth, chicken and sausage. Bring to a boil. Reduce the heat and simmer for 15 minutes. Remove the chicken and shred with a fork. Return the chicken to the gumbo. If a thicker consistency for your broth is desired, bring the gumbo to a boil and add the corn starch mixture. Simmer 1-2 minutes or until just slightly thickened. Simmer over low heat until ready to serve. 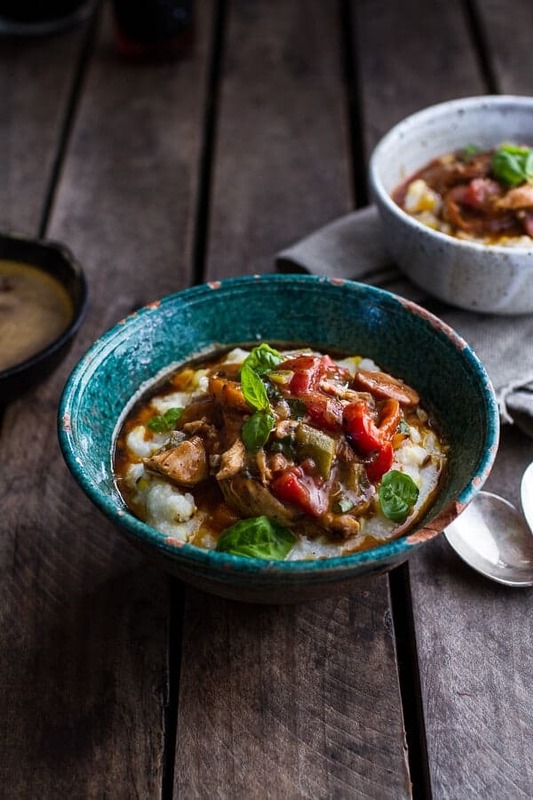 While the gumbo is cooking, prepare the grits. In a small pot, bring the water, milk, and salt to a boil. Slowly stir the grits into the boiling mixture. Stir continuously until the grits are well mixed. Let the pot return to a boil, cover and lower the heat to low, cook for about 20-30 minutes, stirring occasionally. Add more milk if necessary. 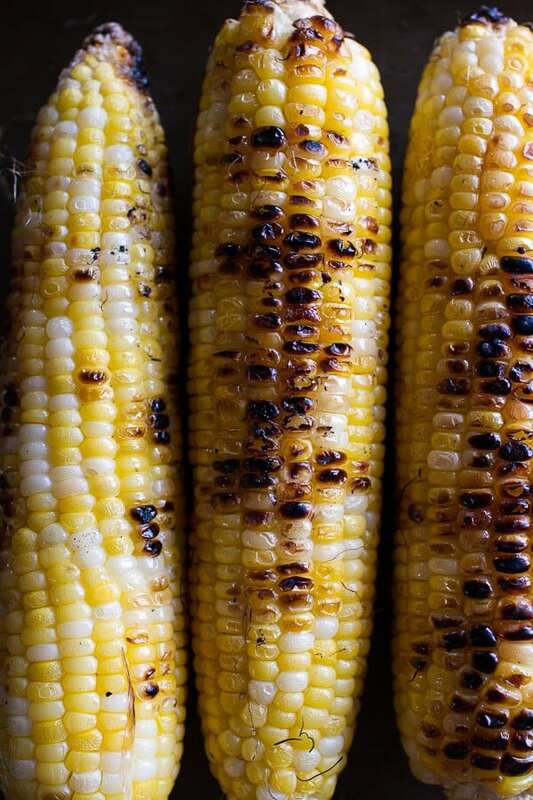 Once the grits are creamy, stir in the butter and grilled corn kernels. Season with salt and pepper. To make the smoky chilied brown butter, heat a heavy-bottomed 10-12 inch skillet, add butter and melt over medium heat until just browned. Butter will melt, foam, and froth, and then begin to brown along the bottom. Whisk the browned bits off of the bottom of the pan. Stir in the smoked paprika and chili powder. To serve, divide the grits among bowls. Top with gumbo, drizzle with butter. Garnish with basil if desired. Enjoy! 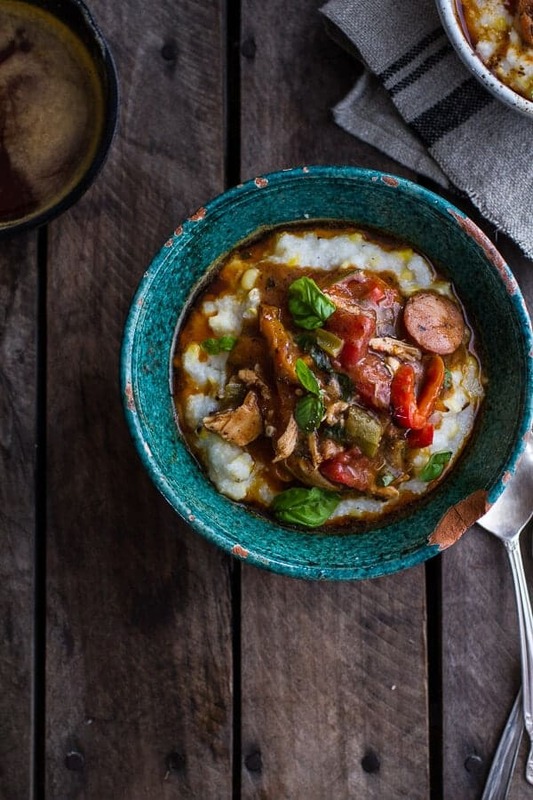 Quick Gumbo with Grilled Corn Grits – trust me, you need to make this tonight. 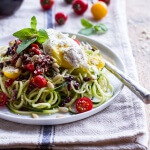 15-Minute Zucchini Pasta w/ Poached eggs and Quick Heirloom Cherry Tomato Basil Sauce. 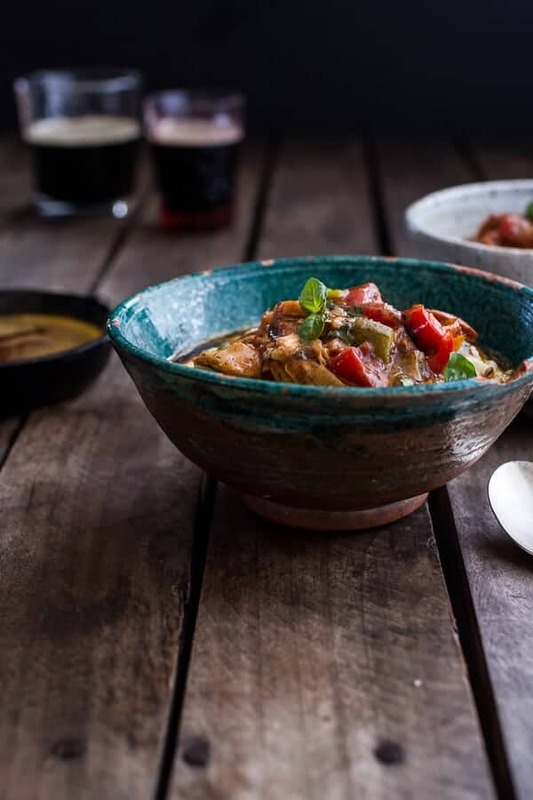 That’s one gorgeous bowl of gumbo…can’t wait to try it.. Thanks for shring this recipe. It look great!! I’ll try it, maybe this weekend. I’m glad I’m not the only one to feel hungry after reading this! It’s coming into summer, and I think some corn might be the first thing on the BBQ this year! Yes!! That sounds great! Hope you love it Jason! 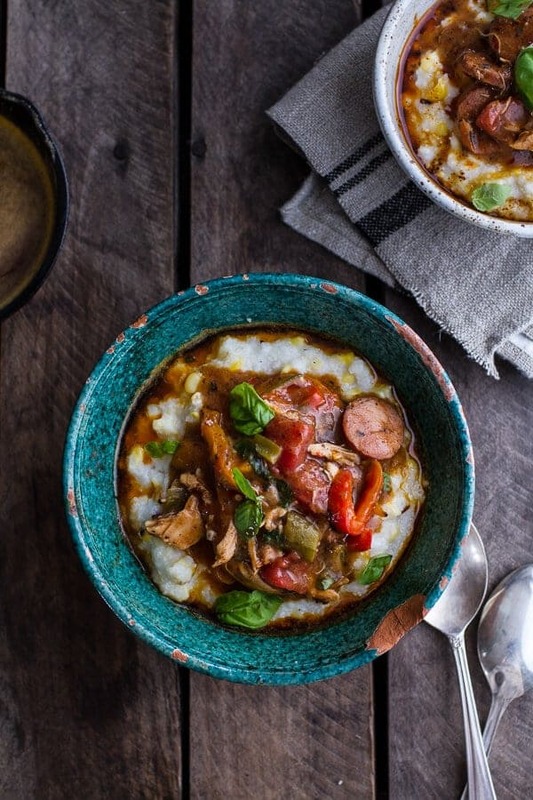 HOW DO YOU MAKE GUMBO SO PRETTY! your talent blows my mind. This looks SO GOOD, my goodness! Ps, we had chickens when we first got married. The fresh eggs are THE BEST. I miss them! Pinned! I’ve been thinking about grits ever since you made balsamic tomatoes and blue cheese.. i can’t believe i still haven’t made that. Too busy eating and making zucchini granola and Asian zucchini soba noddles ( ok, little zucchini obsession here still). But i am making grits very soon. 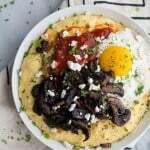 By the way, it’s all the same to me too — grits or polenta 🙂 Hope one of your followers know. canola oil == Canadian oil , made from rapeseed ?!! — actually toxic , and in order to extract the oil they use highly industrial process. I actually run from the word, never-never use it. Thanks for the post, happy Monday. 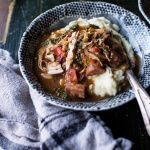 After being sick all day yesterday, this gumbo looks like the giant bowl of comfort I need! And I am with you on the fried egg, they make almost ANYTHING better!! Hello, big bowl of comfort! Love this, T! Total comfort, right? Thanks Ashley! I sooooo be making this recipe. Funny, I came across your other gumbo recipe this weekend. Glad I waited. Thanks Rie! yOu have to try both, they are both good, but in different ways. Hey Rie, just seeing this now. SO SORRY!! It’s a wide range because I know that some people prefer their gumbo either thick like stew or thin like soup. Add more for soup, less for stew. Hope you enjoyed this! Thanks….Made it with the 6 cups. Will use 4 next time. It was AWESOME!!!! Is it wrong to just want to take a spoon to that brown butter? Of course, the whole dish looks delectable. Gumbo in a hurry? Yes, PLEASE!!! This looks absolutely incredible, Tieghan! Fall’s finest flavors, all in one dish! Awe, thank so much! Hope you had a great day, Monday! 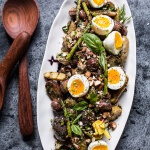 Absolute comfort in a bowl and that brown butter – yes!! Thanks Laura! 🙂 I am so into cozy recipes right now. LOVE gumbo but I hate how long it takes to make! I’ve done it once and the roux took me 3 hours haha – I love this quick version and omg that brown butter on top…swoon!! Perhaps the best name of a dish I’ve ever seen!! Thank you!! 🙂 Hoping your monday was well, manageable! Thank you!! So glad you loved it, but sorry it was a little spicy for the rest of your family. PS, the boys have already got the dirt bike track all laid out. Our neighbors hate us. Ha! BTW: our cows name is Cupcake, yep I really Do luv that cow! Sounds amazing, do you think this could every work in the crock pot?! That would be awesome! Hey Sopiha, I do, but just make sure to cook the roux on the stove first and then add it to the crockpot along with the remaining ingredients. Grits, polenta, or cornmeal mush no matter what it is called I love it. I like this quick version of gumbo. Tieghan–I found the Delallo at a Cincinnati store called Jungle Jim’s. Now I’m ready to make that recipe–LOL. Oh awesome!! 🙂 So happy you found it! Thanks so much, Nancy! Hope you had a great Monday! I absolutely LOVE gumbo! And love this twist on it! Thanks Laura! Hope you had a great Monday! Amazing gumbo! We loved this! Yum! This is perfect for a cool fall day! Thanks Jenna! It is perfect for a fall day! I could totally see you living it up with your fam on the farm. It’d be amazing to source all of your food from your backyard! This gumbo? Will.freaking.do!! Thanks Julia! 🙂 Hopping you had a great Monday! I want chickens so bad! But, we live in the “city” and we aren’t allowed. Boo hoo. 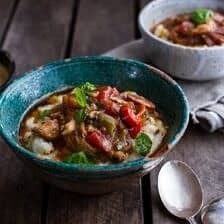 Gumbo has been on my list to make for a while, but I have to say your version trumps any version I had in my head! UGH. Seriously, that is Boo hoo! I’m all about a big bowl of something warm and comforting on Mondays! This looks like it would hit the spot! We’re hoping for chickens in the next year or two! Thanks Monet! Hope you get those chickens so, it is so rewarding! 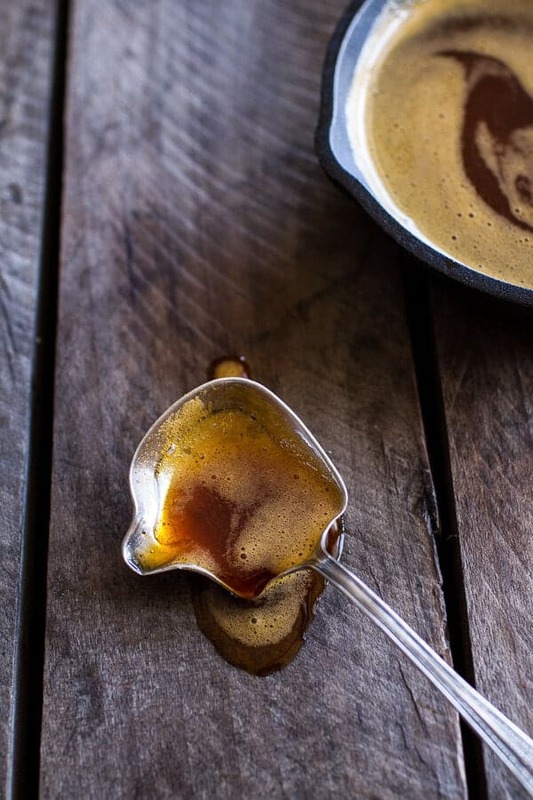 That brown butter pour shot – yeeessss!!!! Such a wonderful meal. Love that smoky chilied brown butter!! This gumbo is so fantastic! It has been the perfect fall comfort food this week. I used Trader Joe’s roasted corn, since fresh off the cob was hard to come by this late in the season. I’m sure fresh would have been better, but it was still delicious. I also had to go on a wild goose chase to track down fresh andouille…totally worth it. Thanks for the recipe, I’ll definitely be making this again! So excited you loved it! Thanks! Made this for dinner tonight, it was easy & awesome! I used shrimp instead of chicken & it turned out great. Definitely gonna make this again (& again). Thanks! Thank you! Thrilled you loved it and great idea with the shrimp, yum! I made this last weekend and it was soooooo good!! Every single bite was full of flavor. I’ve been thinking about it all week, so I just had to comment:) YUM YUM YUM!!! Thanks for sharing it! Hey Sam! Just use any spicy sausage that you like. Will that work? I love spicy, but is this bad for your stomach? Not at all, spicy food is very good for you! Thank you! Hope your family love this! This really looks delicious. Thank you for sharing! Thanks to you, now I know what I’ll eat for dinner. You rock! YAY! Hope you love it!! Oh my lord they look incredible, can’t wait to eat one for dinner. Hope you love it Alex! I can not wait to try this! Thank you so much! That looks really good! Nice food photography by the way, using flash or other lightning? Hi Rudy! I use natural lighting from the outside! Thank you so much! I have been waiting for something like this. My mouth is watering…can’t wait for dinner tonight! Awh yay, hope you loved it Samantha!